The record of President Aquino regarding rights protection was again placed into focus after groups criticized his administration’s inaction on issues on impunity and cases of missing individuals who were believed abducted by state forces. The National Union of Journalists of the Philippines (NUJP) yesterday lambasted Aquino’s continued tolerance for media killings and keeping the culture of impunity in the country as the first United Nations Day to End Impunity for Crimes Against Journalists was marked yesterday. The NUJP, in a statement, assailed the government’s apathy and continually feeding impunity on assaults on members of the press, which it said lead to the loss of 171 media workers since 1986. The group slammed Aquino for breaking his promise of justice to Filipinos and repeatedly attacking the press. Relatives of the deseparacidos, or the missing, also wrote a letter to Pope Francis to intercede in seeking from Aquino action in resolving the long list of unresolved cases of Filipinos who have gone missing due to their political ideology. Aquino was lambasted by the union over the Maguindanao massacre, tagged by international media as one of the most inhumane attacks against journalists. NUJP said Aquino’s inaction gave way to the slow pace of the court trials. “It has not helped that President Aquino has not only broken all his promises on justice and good governance, presenting lame excuses for taking back his vow to enact the Freedom of Information Law and even bungling the number of media victims — 32 — in the single deadliest attack on the press in history,” NUJP said. “Worse, time and again, [Aquino made] the media a whipping boy even as the media fulfill their duty of informing the people of what his administration is doing or not doing,” it added. NUJP said that Aquino’s term recorded one of the worst string of media killings of any sitting president, with 30 journalists dying under his watch. “Instead of ordering an end to the killings, he has continued to offer what amounts to a justification for the murders, hinting without providing any evidence that the victims were either not killed on the line of duty or were engaged in less than ethical undertakings,” NUJP said. “… [Benigno Aquino III] has failed to fulfill his pledge to protect our rights and freedoms and, because of this, how his hands are stained with the blood of our fallen colleagues,” it said. The Palace on its part said the case – which has been stagnant in the courts for four years – is being looked into by Justice Secretary Leila de Lima herself, to directly focus on the prosecution and improve communication between the Department of Justice (DoJ) and private prosecutors. “The President is one with our countryment in seeking service of full justice through delivering conclusion from the current litigation. On the other hand, the judiciary is a separate branch of government that’s why it has it’s own moves,” Communications Secretary Herminio Coloma Jr. said. Coloma commented on the Quezon City Regional Trial court’s act to allow 25 suspects to post bail, saying that he respects the court’s decision. “The decision of the court is its own decision. We have no power on that. In the right moment, prosecutors will take rightful steps according to their estimate in the situation of the trial,” Coloma said. 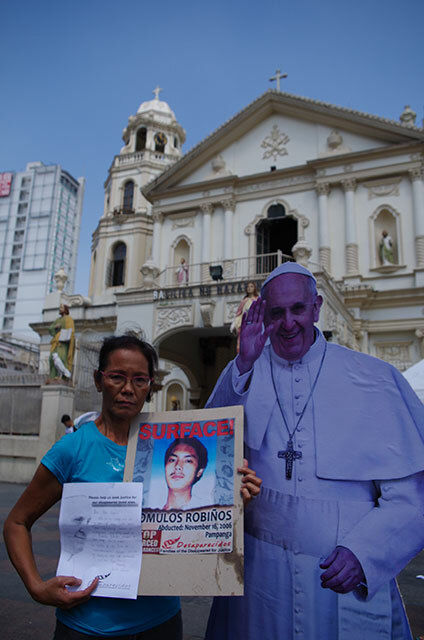 “Your Holiness, please intercede for us in seeking justice for our disappeared loved ones,” wrote families of desaparecidos to Pope Francis as they gathered at Plaza Miranda on All Souls Day. 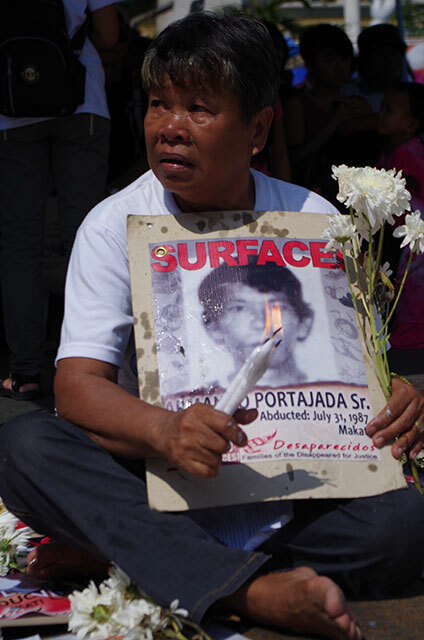 As a renewal of vows to seek justice, they lighted candles and offered flowers to remember those who were forcibly abducted and disappeared by state security forces since martial law up to the present. “It has been the practice of families and relatives of victims of enforced and involuntary disappearances to gather every November 2. 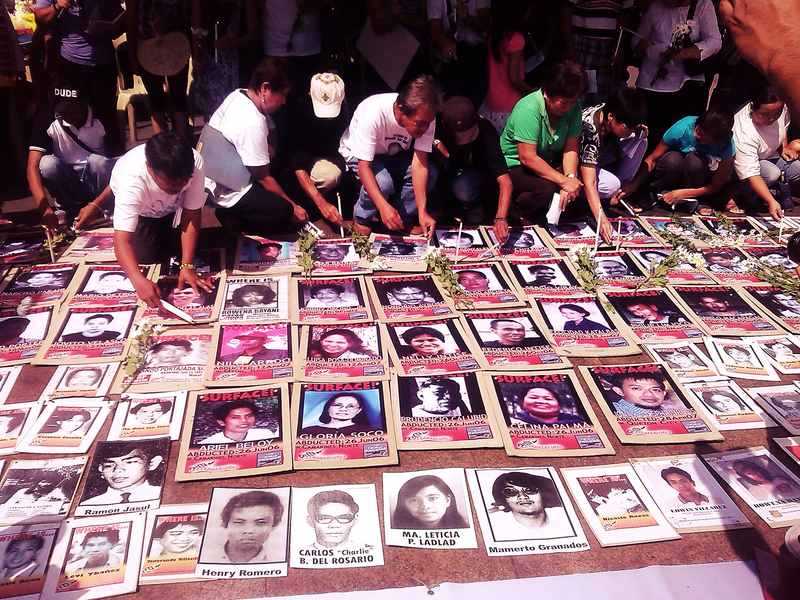 Beyond remembering, we come together as a reminder that our loved ones have yet to be surfaced and the state’s policy of enforced disappearances be stopped,” Desaparecidos secretary general Aya Santos said. 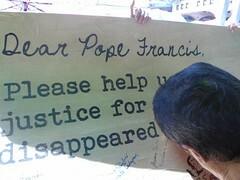 It has become more significant as families of desaparecidos gathered to join the nation in awaiting the visit of Pope Francis to the Philippines in January 2015, according to the group. Santos explained they have followed and listened to series of statements Pope Francis on justice and human rights. For the families, his visit is an opportune time to voice out the injustice and rights violations in the Philippines. “Hope springs when on several occasions he made clear his firm stands to defend human rights and in seeking social justice. We turn to the Pope for support because under the current regime of Noynoy Aquino, human rights violations against the people intensify without let up. We stand as testimonies to the gross situation of human rights here,” Santos said. Santos said there have been 21 victims of abduction under Aquino and has since added up to the number of desaparecidos since the Marcos dictatorship. Despite the passage of the Anti-Enforced Disappearance Law, the crime of enforced disappearance continues as a state policy under Oplan Bayanihan, Aquino’s counter-insurgency program. Also, as a DAP recipient program, it uses public funds to abduct, torture and disappear persons. It also uses funds to coddle the likes of butcher Jovito Palparan who is a ‘free man’ at Fort Bonifacio. “We pray that the good Pope will listen to our plea and stand one with us in calling to stop enforced disappearances in the Philippines. Dear Pope, please heed our call for justice. We cry out to surface all the disappeared, in the Philippines and other parts of the world, such as in Latin America and Argentina, the Pope’s homeland,” said Santos. Born Jorge Mario Bergoglio, Pope Francis is from Argentina, a nation that also suffered the worst kind of human rights violations under a dictatorial rule in the 1970s. “That dog doesn’t hunt,” said Lorena P. Santos, secretary general of Families of Desaparecidos for Justice, referring to the Anti-Enforced and Involuntary Disappearance Law as another farmer-activist in Roxas City, Isabela was reported missing since February 28. 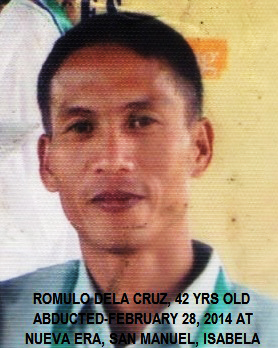 Romulo de la Cruz is the sixth victim of enforced disappearance since the law was enacted in December 2012. 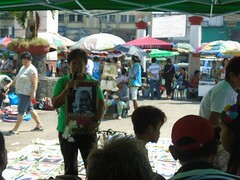 “BS Aquino should also apologize to the public for the persistence of this heinous crime despite the law,” Santos said. Based on Karapatan’s documentation, there are now 20 victims enforced disappearances under the BS Aquino regime. Dela Cruz was a member of Agbiag Matusalem Association-Roxas Isabela (AMA-RI), a local farmers’ organization affiliated with a progressive Danggayan Dagiti Mannalon iti Isabela (Dagami). De la Cruz’s son and relatives, with the assistance of AMA-RI members, immediately reported the abduction to the San Manuel police station. The police inspected the site of the incident and declared that the case is “outside their jurisdiction because Dagami has ‘several rival organizations’. “Where else will victims and their families seek help when government authorities are not cooperating? The authorities don’t seem to know the law,” Santos said. 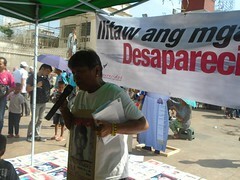 “The Aquino government takes pride on the Anti-Enforced and Involuntary Disappearance Law as the first in Asia. Yet, not one perpetrator has been prosecuted. Not even the poster boy of impunity, Gen. Jovito Palparan who was already served with a warrant of arrest more than two years ago,” Santos added. Coming from his son’s wedding, de la Cruz was driving a motorcycle together with one of the wedding sponsors. His son Romy and his wife were on another motorcycle behind Romulo’s when a van suddenly cut them. A man, whose face was covered with a handkerchief, alighted the van and pulled Romulo off the motorcycle. The man said he was a member of the National Bureau of Investigation. The man pushed Romulo inside the van and sped away. Dela Cruz remains missing as of this writing.